Although Idaho had some large range fires in June, they did not get much attention because they mostly burned rangeland that was already severely degraded with cheatgrass, BLM-planted crested wheatgrass and related cultivars, and overgrazed. This is, of course, an overgeneralization, but the fires did not attract more than local and a little regional attention. Now, however, forest fires are breaking out in the heavily timbered high mountain country deep in central Idaho. 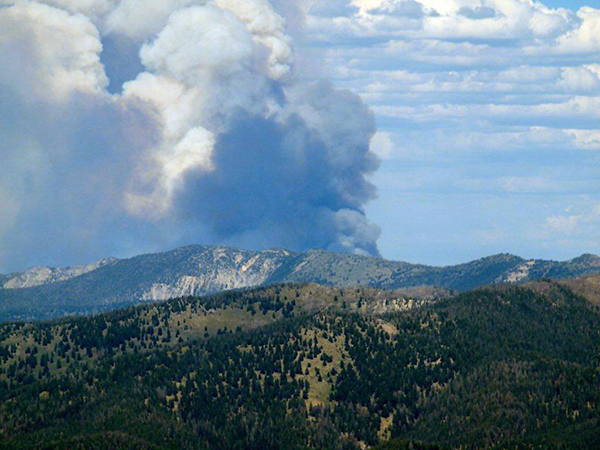 The largest is the Halstead Fire, estimated at about 25,000 acres. It is on the Salmon -Challis National Forest about 25 miles north of Stanley, Idaho. It is burning mostly from Beaver Creek northward and eastward into the rugged mountains of the Frank Church Wilderness where there are a number of sparkling sub-alpine lakes in cirque basins. It hasn’t reached them. What no one seems to have said in the media is that this fire is a continuation of 25 years of fires that began about 40 miles to the west in 1987 and gradually burned here and there moving eastward in 2000 to 50,000 acres chunks over the period. The appearance of the areas has been transformed. In some places the regeneration is now well advanced. In others it has been slow or barely begun. It would be fascinating to see an good ecological overview of the changes, and other changes, such as how the burns have affected wildlife, and for hunters, successful hunting strategies. Even a good map of burns over the last 25 years would be fine. In the year 2000 alone, over 500,000 acres of the vast (2.4-million acre) Frank Church Wilderness burned. The Halstead Fire has some room to burn. It is mostly to the south and southeast out of the Wilderness in Knapp Creek and beyond. After a brief somewhat cool spell, temperatures are predicted to soar beginning August 5 into the mid to high 80s (this country is above 7000 feet). Dry thunderstorms are also predicted too. All routes into the SE corner of the Frank Church Wilderness are now closed to entry. More significantly to recreation, a large area of lightly roaded and roaded backcountry northeast of the Stanley is closed to entry all the way down the main fork of the Salmon River to its confluence with the Yankee Fork. Photos of the fire and information at Inciweb. Any word on anyone stranded in fire area out from Stanley? I think my son is up there .. Went up on July 26 for weekend to get cords of wood/fish; was coming down last Monday to start job in Salmon. he would have called for father’s birthday- did not; his cell does not answer. I am very worried. I wouldn’t worry. The fire is in the backcountry/wilderness. Cell phones don’t work in central Idaho except in a few spots (locals learn where they are). Look for more Idaho fires to start soon. I drove from Cougar Mountain Lodge to Emmett and back yesterday and the Squaw Creek drainage near Ola is completly covered with dry Cheat Grass ready to burn. The forested areas here in Valley County are very dry. I have been cutting the dead branches off of all of the trees on my property to help prevent them from catching fire if one starts. I’ll be heading to Montana and Washington in September. I hope there’s some relief soon. Not much rain on the radar. Yellowstone and Teton seem to be doing okay. Thank you for response Ralph; hopefully he is just thoroughly enjoying that great outdoors he loves so much and is OK. I camp in the Beaver Creek area all thru the fall. Bummer this year.